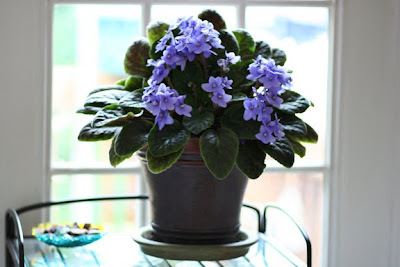 I've introduced the African Violet before. The first time I introduced it was back in March, March 1st to be exact. It had one or two little flowers and a bunch of buds. Then April 1 it had a bunch of blooms. Well, here it is over 6 ... SIX ... months later and it has been blooming all this time. SIX months people. I don't know of any other plant or flower, or at least we don't have any that have bloomed this long and this beautiful. Some of our plants bloom the most beautiful flowers for a day, some a week, some a month, some maybe even 2 or 3 months. But not six months. Actually this African Violet has bloomed like this before and for longer. When we first got it in September of 2007, it bloomed for over 10 months. Then it took about a 2 month break to rest and refuel. We determined that this plant has graced us for so long because it was grateful that we saved it. Had we not brought it home from my mother's funeral it likely would have perished. We've also determined that this plant, once it does pass (and I have no idea how long it may live), will reincarnate as either an animal or a person. It's got amazing energy ... it's clearly burnt off any bad karma. We have other plants that we believe will reincarnate as animals or people. So, really, when it comes down to it ... plants are people too.